Take back your tap. Transform it with UltraWater. We know how important it is to drink enough water each day. We also hear about the hidden dangers lurking in tap water and plastic water bottles. Standard treated tap water still contains urban, agricultural and industrial runoff such as pharmaceuticals, heavy metals and cleaning by-products from the actual water treatment. If we consume water that is not properly cleaned of toxic, chemical pollutants then we are right back to where we started. And that is why you owe it to yourself and family to know what is in your water … to find out how you can take back your tap. AlkaViva has spent over two years in research and development to dramatically advance the performance of drinking water filtration. To create the cleanest, healthiest and best tasting water possible at an affordable price. The result is the range of AlkaVivaTM Ultrawater filtration products. Products capable of the most advanced contaminant removal while retaining the beneficial alkalizing minerals. 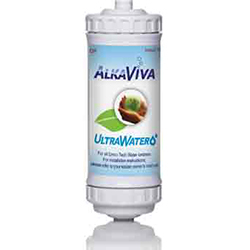 Try AlkaViva ™ Ultrawater products and enjoy the cleanest, alkaline ionized water possible with most chemical pollutants rendered non-detectable. The media used in all our UltraWater products has been extensively tested by a USA, independent Government approved laboratory, certified under the strictest EPA/ANSI protocols and NSF Standards 42 and 53. 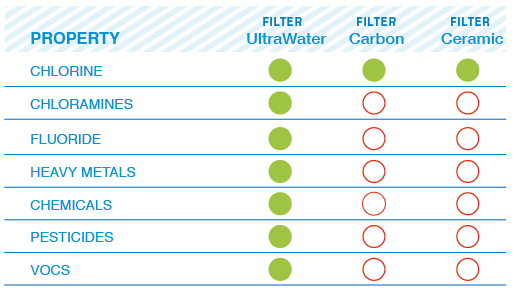 Inside each UltraWater filter is the patent-pending technology that forces contaminated water to flow in a tortuous path through supercharged media, trapping contaminants across the board while leaving the beneficial alkalizing minerals intact. 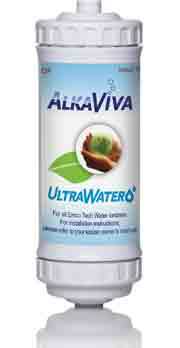 Imagine the cleanest and healthiest water as nature intended – that is the next generation – that is AlkaVivaTM Ultrawater. The way water should be! Only AlkaViva has the confidence to test their products using an independent US EPA-Certified lab. Only AlkaViva has the confidence to test against other brands using a US EPA-Certified lab. An ionizer’s performance can become compromised over time. Our ionizers and cleaning systems are light years ahead of the competition. Our ionizers are more efficient and so use less power than any other brand. Our water products replace the need for disposable plastic bottles. We’ve been selling ionizers for over 10 years and are confident they will last a lifetime with proper care. We back our belief with a limited lifetime warranty.